Township NineBarnum & Celillo Electric, Inc. The Barnum & Celillo Electric Multi-Family Division is proud to be a part of Brown Construction’s team. 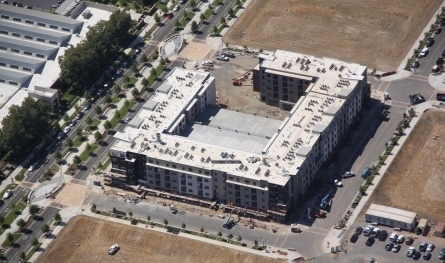 Working on the first major building at Township Nine, that was once the largest cannery company in California, located along the American River in Downtown Sacramento. The project is a 5 story building which includes 180 apartment units, a multi-level parking garage with ground floor urban retail area and other convenient amenities for occupants. This facility was built with a complete integrated systems package ranging from: Fire Alarm, Security, Telephone Entry, Access Control and a 2-Way Area Refuge. We would like to thank Brown Construction for the opportunity to work with them on this phenomenal project and looking forward to many more successes to follow.